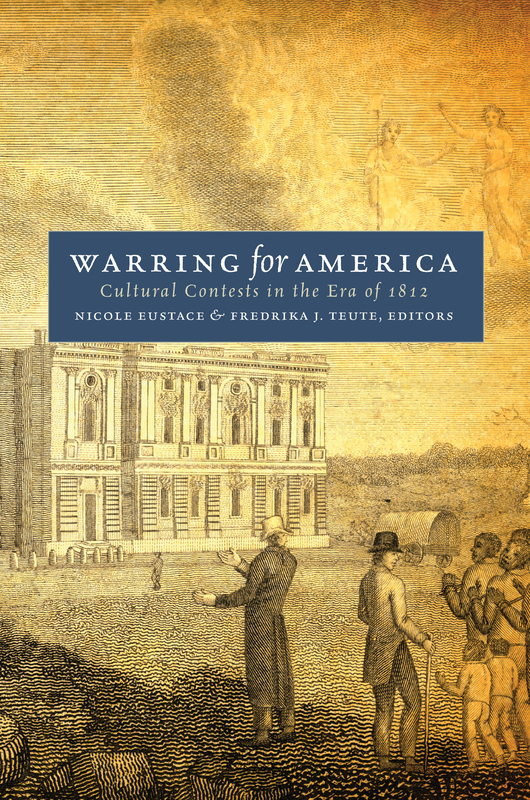 Today we happily welcome a guest post by Nicole Eustace, co-editor, with Fredrika J. Teute, of Warring for America: Cultural Contests in the Era of 1812, published for the Omohundro Institute of Early American History and Culture, Williamsburg, Virginia. The War of 1812 was one of a cluster of events that left unsettled what is often referred to as the Revolutionary settlement. At once postcolonial and neoimperial, the America of 1812 was still in need of definition. As the imminence of war intensified the political, economic, and social tensions endemic to the new nation, Americans of all kinds fought for country on the battleground of culture. The War of 1812 increased interest in the American democratic project and elicited calls for national unity, yet the essays collected in this volume suggest that the United States did not emerge from war in 1815 having resolved the Revolution’s fundamental challenges or achieved a stable national identity. The cultural rifts of the early republican period remained vast and unbridged. In this post, Eustace discusses the idea of determining national affiliation by geopolitical barriers. Can physical boundaries decisively shape social relationships? Do geopolitical barriers define the terms of human connections? Contentious throughout U.S. history, questions such as these have recently taken on extraordinary urgency as efforts to impose new limits and divisions on the people who live and work in the United States have begun to rise rapidly. While many might assume that a clear connection between landed location and national affiliation has always been the basis for determining a country’s legal membership, this means of defining the rights of citizens emerged only slowly in early America. The essays collected in Warring for America: Cultural Contests in the Era of 1812 do much to document the contentious debates that surrounded questions of national belonging in the early United States. In her aptly titled essay, “‘Borders Thick and Foggy’: Mobility, Community, and Nation in the Northern Buffer Zone,” author Karen Marrero captures contemporary unease about the porosity of national parameters. Studying the edge-land region of the Great Lakes between Canada and the United States through the 1830’s, Marrero asks whether the sense of communal belonging among these early nineteenth-century North Americans most often grew from the land on which people dwelt or germinated from the seed of lineal ancestry. Ultimately, she argues that the United States largely succeeded in enforcing a notion of national affiliation dependent on the “external” issue of physical residence over the British and Indian preference for defining national membership on the basis of the “internal” and embodied question of ancestry. If it is impossible to be in two places at one time, then land-based models of national affiliation precluded the possibility of dual citizenship. But for Indians who considered cultural ties to be the more reliable indicator of national loyalties, a multi-faceted national identity remained very much a possibility. For the Potowatami subject to the administration of British Canada, the issue of legal consent (that so pre-occupied American theorists) mattered far less than the more fundamental fact that their nationality was something they carried with them in their bodies no matter where they might be forced to migrate. Marerro’s work reminds us of both the formal success of legal tactics intended to restrict membership in the United States and the informal endurance of alternate ways of defining belonging. Other essays in the volume explore the power of culture to destabilize efforts to restrict people’s connections to the nation. In the volume’s leading essay, “Minstrelization and Nationhood: ‘Backside Albany,’ Backlash, and the Wartime Origins of Blackface Minstrelsy,” David Waldstreicher analyzes the genre of “blackface” minstrel shows to argue that comic ridicule of black sailors implicitly undermined efforts to ignore African American contributors to the early United States. Even as the black sailor was held up as a figure of fun, he was pressed into service as a national spokesman. The very attention audiences bestowed in derision served to spotlight the place of African Americans on the national stage. Such efforts to undermine African Americans only added to public awareness of their presence in the nation and their key contributions to it. As the United States leaders of 2017 contemplate dividing families and decimating workforces with new rules strictly limiting travel and immigration, they might do well to contemplate the human costs and historical errors inherent in such attempts. If American inhabitants were “warring for America” in the era of 1812, the struggle itself has never truly ceased. Nicole Eustace is professor of history at New York University and co-editor of Warring for America, which will be published in September 2017. She is also author of Passion Is the Gale: Emotion, Power, and the Coming of the American Revolution (2011). Both books are published by UNC Press for the Omohundro Institute of Early American History and Culture, Williamsburg, Virginia.